One of the quickest ways to identify an older airplane is to look at the panel. Here at Plane & Pilot, we’re fortunate to fly a wide variety of new and used general aviation models, most of them in excellent, refurbished condition. That’s partially because manufacturers discovered long ago that making changes to a proven design is extremely expensive. The FAA often forces anyone with the audacity to change a production design to jump through some fairly ridiculous hoops. For that reason, it’s often difficult to tell a newer airplane from an older one—unless you’re an expert on the type. My personal airplane (which I rarely get to fly) is a Mooney, and unless you know the type fairly well, you might be hard-pressed to identify the year. Take one look at the panel, however, and you’ll know this could be your grandfather’s airplane. The instrument panels of most aircraft are nearly always a giveaway to the model’s age. That holds true from the bottom to the top of the aviation spectrum. Newer airplanes may feature flat-panel displays for all aircraft condition, navigation, communications and operating parameters. Older ones sometimes offer new paint and interior, along with a few new radios, but the basic panel those avionics are mounted in frequently look like something out of a South American locomotive. That may not be so bad if you’re flying a 20- to 30-year-old personal single for vacations and weekend hamburger flights, but it can become more critical on business aircraft that are often on call and must work for a living 24/7 in VFR/IFR conditions. King Airs fall into this category. They’re among the most popular twin-engine business turboprops, with some 4,000 examples built, and the King Air 200 is one of the kings of corporate transports. Introduced in 1974, the basic King Air 200 has enjoyed the longest production run of any civilian turboprop in its class. The now-Textron airplane continues to fly between essentially the same 850 shp P&W PT6A-41/52 turbines that it has used for more than 40 years, and it continues in production today as the model 250. Most of those early King Airs were equipped with Collins radios, a prestigious and reliable line of avionics for the time, but hardly up to the standard of today’s corporate designs. Collins no longer supports the avionics installed in those early King Airs, and even if it did, technology has long since passed those original boxes by. The result has been that pilots transitioning from lesser turbines or piston twins frequently have had to train with radios that were one or two generations older than the airplanes students are stepping up from. Therein lies the rub, and SIMCOM of Dallas, Texas; Orlando, Fla. and Scottsdale, Ariz., saw an opportunity to provide transition training in an improved version of the older King Air 200s. SIMCOM is one of the dominant general aviation simulator companies in America. It trains in a little of everything, offering transition and/or type-rating courses in a wide variety of aircraft. These include but aren’t limited to the piston-powered Bonanza, Malibu, Aerostar, Baron, Navajo and others: the turboprop Cheyenne, Conquest, Twin Commanders, Mitsubishis, King Airs and all three of the current, single-engine turbine singles (TBM 900, PC-12NG, Meridian); and jets such as the Citations, Eclipse, Falcon, Hawker, Westwind and Learjet. In some cases, SIMCOM can transition a pilot from a piston-single to a twin-jet type rating. To that end, SIMCOM offers state-of-the-art, FAA, level D, full flight simulation. …pilots transitioning from lesser turbinesor piston twins frequently have had to train with radios that were one or two generations older than the airplanes students are stepping up from. Just as with airline simulators, SIMCOM’s training machines can take a pilot all the way to his type rating and allow him to step directly into the right seat of a corporate jet on a revenue flight without ever having set foot in the real airplane. The Garmin G600 consists of a 6.5-inch tall by 12-inch-wide flat panel display that’s split in the middle—PFD (primary flight display) on the left and MFD (multi-function display) on the right. In addition to rolling tapes for airspeed, altitude and rate of climb, there are digital window readouts of heading, true airspeed, ground speed, OAT, target altitude and most other parameters of flight. Significantly, the G600 comes with its own version of synthetic vision—an electronic, virtual reality system that creates a forward view of terrain and airport features independent of weather. As the name implies, the multi-function display offers your choice of electronic images: weather, charts, terrain, moving map and a variety of other readouts. The Garmin GTN750 is the touch-screen GPS/navcomm/MFD retrofit system designed to couple with the G600 and display charts, traffic and weather, plus whatever else you need to reference or interface. Together, the two boxes comprise nearly the equivalent of a Garmin G1000, though in a more compact package. It has been around for at least five years, but like so much of the new technology, price has constrained sale in all but the more expensive aircraft, many of them fitted with the larger, Garmin G1000, two- or-three-screen flat panel display. (In fact, Garmin has even approved the G1000 as an aftermarket product for installation on model 90, 200 and 300 King Airs only, provided you can justify the expense; typical out-the door price is $330,000-$360,000). Like most of SIMCOM’s advanced simulators for piston and turboprop models, the King Air 200 is a fixed-based trainer. (Most of the jet trainers utilize full motion-based sims.) The unit doesn’t move on any axis, but that doesn’t compromise its ability to reproduce in-flight sensations. The SIMCOM King Air 200 trainer is mounted in its own room with a visual display screen that spans forward 160 degrees and reaches from floor to ceiling. The simulation of external features is very good and can be regulated from a medium bright twilight environment to a pure night image. Simulators provide what may be a nearly ideal training environment in that they allow a student to perform repetitive training tasks that might be difficult, impossible or simply unsafe in an actual airplane. Learning instrument flying is especially easy in a simulator, since a student can perform a particular procedure over and over without having to fly an airplane around the pattern each time. Similarly, an instructor can simulate a variety of emergencies that would be nearly impossible to reproduce in an actual aircraft in flight. Depending upon how diabolical your instructor is, he can fail practically any working system on the airplane. That includes an engine, the entire electrical system (or individual components), landing gear, deploy flaps asymmetrically, simulate an engine fire, loss of pneumatic instruments or any of several dozen other emergencies, and you can practice them until you get them right. You can also practice normal procedures more efficiently, fly an ILS, GPS or VOR approach, work on maneuvers, become more familiar with systems operations or practice anything that needs brushing up. (Once, several years ago, I went to Luke AFB, Ariz., to fly the F-16 Fighting Falcon. The night before my flight, the Air Force put me in a simulator between 1:00 a.m. and 3:00 a.m. to get familiar with the cockpit. At SIMCOM, Kevin gave me my choice of departure points, so we decided on JFK as a location and entered a flight plan to Denver, Colo. I had flown in and out of JFK several dozen times as a passenger, often on allegedly cheap flights returning from ferry deliveries to Scandinavia, Europe, Africa and the Middle East, so I was somewhat familiar with Kennedy’s physical layout as seen from the small window of an airliner. The SIMCOM King Air simulator was a whole different experience, however. The sim I flew in Dallas consisted of most of the cockpit of an actual decommissioned King Air, a very early one from the 1970s. This is a common practice in flight simulation—resurrect a cockpit from a real airplane rather than try to build one from scratch. This method allows a student to walk into a cockpit that’s already familiar or soon will be when he or she transitions to the real airplane. The SIMCOM King Air 200 wasn’t constructed to look like a real cockpit; it was a real cockpit. The simulated outside world also was easily believable for a hazy day in New York City. Never mind that the external visual display isn’t perfect. There’s little reason it needs to be. After all, the VFR presentation isn’t as relevant as the panel and operational controls, since most work in simulators is intended to “imagine” IFR conditions. The instructor, sitting directly behind you, has the capability of making your flight reasonably straightforward or he can complicate it to any level, introducing a wide variety of system faults. He can also control all aspects of weather in the sim, from temperature and pressure to ceiling, visibility, wind or turbulence. (Another flashback. I once flew a make-believe 421 out of Wichita Mid-Continent as part of a multi/instrument refresher course. I climbed up through an overcast based at 4,000 feet, leveled at 9,000 then, predictably, lost an engine and was directed to turn back to Wichita. I got established on the ILS, only to be advised that the weather had dropped to 200 and one, and that all available alternates were even worse. I did a semi-reasonable job of flying the approach with the left engine caged, and when I hit minimums and looked for the runway, I was still in cloud. As I started to apply power to execute the miss, my instructor said, “No miss, continue the approach.” I did and wound up slamming down slightly off the left side of the runway. Meanwhile, at our simulated JFK takeoff, we started engines, and I began to taxi out for runway 4R. Kevin set me up on the threshold, I brought power up to 90% and released the brakes. This is a non-motion-based simulator, so there’s no characteristic lurch forward when you unleash the King Air 200’s pair of P&W PT6As. Still, the sensation of artificial acceleration becomes very believable with the advantage of synthetic vision. The white line begins to unroll beneath the nose just as it does on the outside visual image, imparting a feeling of increasing speed. It becomes even more realistic when you rotate and point the nose up for climb. On my first takeoff, I over-rotated and pitched too high, then corrected slightly, phugoided up and down once or twice and finally settled on a reasonable climb attitude. As with many simulators, pitch and roll are more sensitive than they’d be in the actual airplane, a function of hydraulics reacting to pilot inputs rather than cables or control rods. There’s always a slight delay between input and response in a real airplane, but hydraulics in a simulator respond almost immediately. Once you become accustomed to the control sensitivity, SIMCOM’s artificial King Air 200 flies very much like the real thing. All systems work exactly the same as on the airplane, except there’s no consequence of making a mistake. It’s easy to understand how an aspiring corporate pilot could translate his experience flying SIMCOM’s King Air 200 simulator to the real airplane in a short time. I’m far from a high-time King Air pilot, but the SIMCOM’s exotic teaching machine became comfortable in a short time. Landings aren’t any special challenge, though you’ll never know for sure if you make a bad one, as the simulator doesn’t jolt following a poor touchdown. That’s not really the mission of the SIMCOM King Air simulator, anyway. The inside and outside displays can easily fool your brain into believing this is a real airplane, right down to the sensation of vertigo. SIMCOM has three KA-200 simulators: one in Scottsdale, one in Orlando and the new Garmin G600/GTN-750 equipped simulator in Dallas/Grapevine. The Orlando KA-200 is a full-motion device. 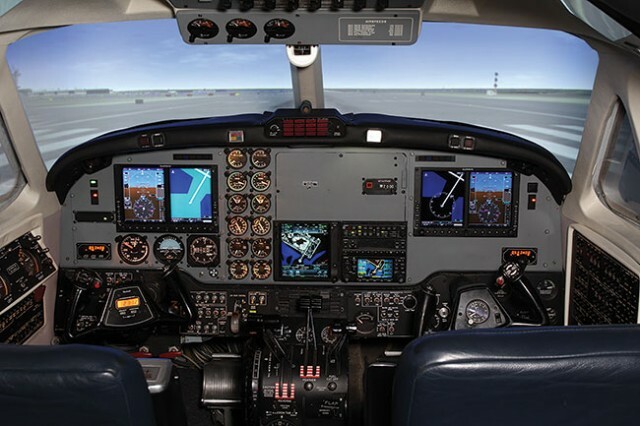 For more information on SIMCOM’s King Air 200 transition course, contact the Orlando Training Center at (800)272-0211 or visit www.simulator.com.